Individual outputs can be sourced from the points shown on the picture below. Ideally the jumper wire should be removed, and the output should be wired to a switching jack. The other side of the jack switch should be wired back to the mix bus i.e. where the other end of the jumper wire was soldered, so that the sound is removed from the mix output when a jack is plugged into the socket. J7 on the bottom right connects a lower level submix of the hats and snare noise directly to the main output. This submix bypasses the accent circuit. This means that the hat and snare won't be entirely removed from the main mix if J3 and J4 are removed, so you might want to wire a switch across J7 so you can mute this submix if necessary. There will be a little crosstalk between the hat and snare individual outputs as they both use the same noise source. EDIT: THIS WAS FOR THE ORIGINAL RUN OF PCB'S. THE LATEST VERSION HAS A SLIGHTLY DIFFERENT LAYOUT THAT MAKES THIS EASIER. SEE THE BUILD GUIDE FOR DETAILS. On further consideration, it seems that to avoid crosstalk between the snare and hat individual outputs you'll have to lift either R61 or R72 as the quiet submix of the hats and snare noise will be leaking back to the J3 and J4 outputs via these resistors. I think the way to do this would be to use an individual output socket that has DPDT switching. One switch disconnects the jumper that connects the sound to the main mix bus and routes the sound out of the output instead, and the other disconnects the resistor that connects the sound to the submix bus. So when you plug a jack into the snare output it disconnects J3 and routes the signal out of the output instead, and at the same time disconnects R61 cutting the snare from the submix so it doesn't bleed onto the hat output and the main mix out. The same goes for the hat output that should disconnect J4 to route the sound out of the output while also disconnecting R72. could I use a rotary switch 4 pole 3 way for outputs then I could switch to mix or individual ..unless you can send diagram of a better way. you could, but i'm not really sure why you'd want to, or what you'd be trying to do. Also, you wouldn't have enough poles to solve the submix problem. You'd be better off with a 6 pole 2 way switch, if such a thing exists. I think it'd be a whole lot easier to just use switching jack sockets. Is it normal for the individual outs to be at a much reduced level compared to the mix out? I can see that the individual outs are before the accent circuitry, but not sure how much amplification occurs without an accent trigger (if any). I've wired each of my individual outs to a pot then to a jack. Any ideas why the individual levels might affect the levels of all the sounds coming from the main output? Working fine when using the individual outs. That could mean any number of things. Can you give a better explanation of exactly what you've done and what the problem is? 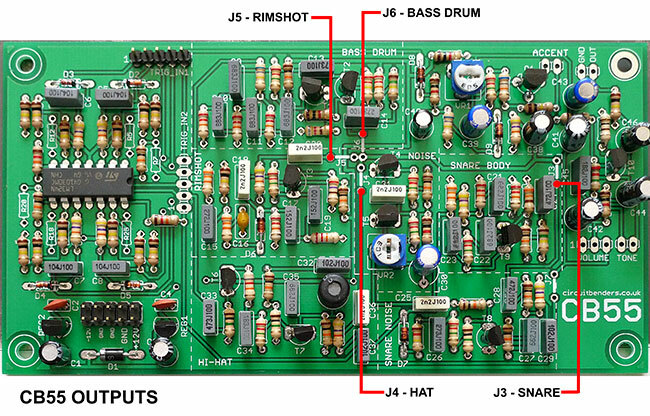 According to that diagram, when you don;t have a jack in the individual output socket the mixbus is connected to ground via the pot. When you aren't using the individual outs, every pot is acting as a kind of parallel volume control on the main mix. Should I use two stereo 10KB pots to wire the individuals outs and switched jack sockets for SD and HH? Sorry for confusing I was searching for a solution to add volume pots to individual outs. I see CeeFo tried this, but - as you mentioned - installing pots to every output they act as a kind of parallel volume control on the main mix.